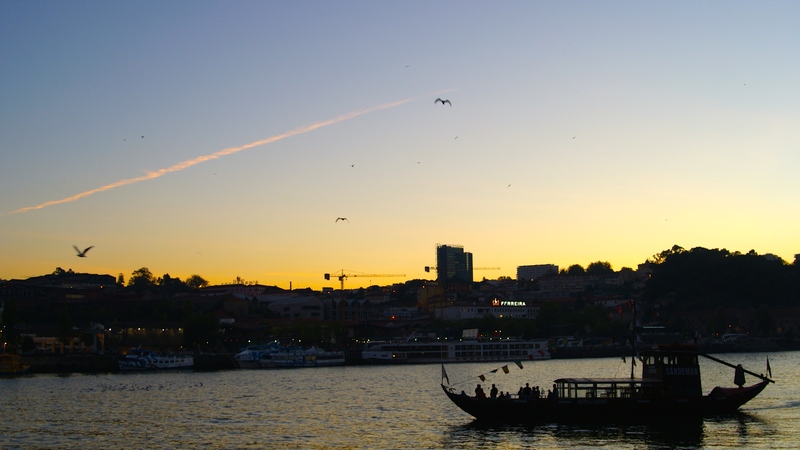 Porto – a land of Cork, Port and delicious treats. After our brief sojourn in Madrid, we step off the plane an hour away in Porto. Portugal has always held a strong allure for me – one of those forgotten front waters of Europe, steeped in medieval history and the romanticism of the age of discovery. The sailors from these cities in yesteryear pretty much discovered half of the world; India, China, Japan, Americas. So yeah theres a little bit of awe and charm to this place. Porto is the old word mixed with the new. Winding steep cobblestone streets and crumbling building facades that inside are populated with the latest shops and trendy brands. Its raining when we step out of the Sao Bento train station and wander down the main avenue to find our Air BnB. But first up, a price sign catches my eye – Coffee and Nata for 1.20.
b) Portugese custard tart in puff pastry. This will be the first of many. Wow these things are ohhhh sooooo goooood! Tucked up off a steep side street, 10 meters from the main tram drag, we have a cosy little apartment fit for two. The rain stops in the afternoon and we wander down to the Cais da Ribeira along the river front and marvel at the colossal work of bridges, wine boats and charm of the old city along with our first taste of port. All of the port in the world comes from here…oPorto. Well kinda makes sense doesn’t it? But where as I used to think this was a gnarly old drink, strong and toxic fit for grandparents and old folk, here its fruity, and spiced with all types of deliciousness. We sit and watch the gulls squark and fly by as the sun sets over the nearby hills and coastline several km’s in the distance. Very happy, Very content with Life. The next day or two is spent savaging all the food – the bakeries here are excellent with pork and fish sandwiches for only a few euro and we dine on platters of sausage, cheese, fig paste, and crackers with port – a picnic that would set us back 30-40 dollars back home is only breaking 10 euros here and exceeds the quality by far. Theres view points, churches from the old world, and an endless maze of passageways to explore and champions league football to watch at night as we drink. After a few days stuffing our faces with everything delicious in sight, its time for some more adventure. Lets go see where this wine comes from – time to head up the Douro Valley. We hire a scooter – a powerful beast for its type and bomb 140km up the valley towards Pinhao. Its a lush long ride after the short road out of Porto and a wrong turn that takes us on to the freeway the wrong way (scooters on freeways are not the most fun!) but soon we are on the right path following up the Rio Douro. We stop just before Entre Os Rios – a confluence of 2 rivers for some lunch – fish, potatoes and tomatoes with an espresso for only 5 euro. Its a simple dish, but like everything here they flavours are delectable. After lunch we soon descend in the the high Douro. The road winds and meanders its way through small farming villages hundreds of meters up from the river below on steep terraced hills. Vineyards and postcard perfect towns fly by in a blur we charge on. Its a long way on a scooter and we want to get there with time to spare in the afternoon. It really is an incredible drive, and after hitting the high points near Mesao Frio we drop down towards the lower valley for the final stretch to Peso de Regua and then bomb onto Pinhao. Pinhao we are told is the best view point. High up on the top hill above the church you can see for miles back up the valley with nothing but vineyards in the way. Amazing, though we don’t make it. We get to the town, check it out and decide to head back to Regua where there is more going on and have an utterly amazing seafood extravaganza for around 8 Euro each. Hands down one of the best meals we’ve managed to date. The ride back down the following day is just as surreal. I don’t have much else to say about this but check the pics and do it if your ever in Porto. Also big thanks to the people at Vieguini Bike and Scooter Rental – I forget his name, but the owner / main guy is awesome.